“Every stage of life has both purpose and gift,” says Joan Chittister in a recent email, “and there is nothing a youth centered culture (like ours) needs more than it needs its ‘elders’. You are invited to explore this vital time of life into which more healthy, well educated, aware, compassionate women are moving into, than ever before in history. We want to reclaim the ancient awareness that getting old is a privilege and comes the sacred responsibility. A Kaumatua of Piha’s Te Kawerau a Maki people named this responsibility as ‘holding the beingness of the tribe’. By giving yourself the gift of these 3 weekends, you will eat, sleep, walk, swim, talk, listen, write, and draw towards your aim of finding, exploring and consciously living your own ‘organic’ spiritual dimension to life. The rest of the morning is free for reflection. We may want to walk; sleep; talk; write; or even swim. We meet again for lunch – hopefully in the garden weather permitting – when we share as much or as little as we want from the morning’s reflections. After lunch, free time to rest or reflect until 3.30 pm when we meet again for our 2nd session – the meaning of eldership is about ‘holding the beingness of the tribe’? 1. Te Kawerau a Maki’s ancient meaning. 2. Te Kawerau a Maki’s current meaning. 3. Our personal ancient and current meanings. Drinks, dinner and sharing of reflections from 6.30 pm. Retire for an early night. Sunday, we meet again for our 3rd session. Lunch, final statements of ‘understanding and awareness’, and leave for home around 3pm. Mrs Joan Erikson, of the “Stages of Human Development” fame, admitted at 93 years of age, that when it came to explaining the final stages of life, she and her husband, Erik, “we got it wrong”. What women have been asking for a chance to get together, share experiences and concerns of this unique journey of aging, in order to discover insights and possible beliefs that could enable us to live in such a way that we offer hope to ourselves and young women that “there are some paths in aging that can feel ‘right’. 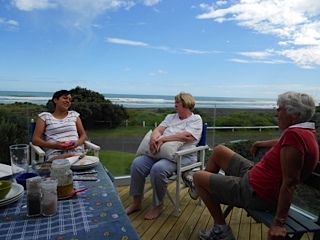 The cost is the normal price for a weekend at Te Wahi Ora – you can even ask for the accommodation you’d like to have – first in first served!